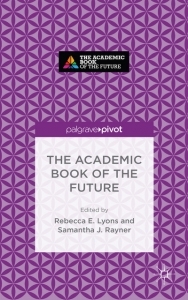 Edited by Rebecca E. Lyons and Samantha J. Rayner, members of ‘The Academic Book of the Future’ investigative team, The Academic Book of the Future presents a short collection of essays by academics, publishers, booksellers and librarians ruminating on the future of the academic book. With the book published through the Palgrave Pivot initiative, Leah Tether welcomes its content and physical form for offering an illuminating insight into the unfolding of the project and a reflection of its future valuable contributions to debates over the academic book. The Academic Book of the Future. Rebecca E. Lyons and Samantha J. Rayner (eds). Palgrave Macmillan. 2015. In 2014, the Arts and Humanities Research Council (AHRC) and the British Library put out a call for proposals for a large-scale project on the ‘Academic Book of the Future’. The successful team was that led by Samantha J. Rayner (Director of the Centre for Publishing, UCL), consisting of five key investigators from UCL and King’s College, London. As part of this project, the team promised to investigate the future of the academic book, using focus groups, events, symposia, conferences, workshops and many other activities, and giving consideration to Open Access models, digital revolutions and the UK’s Research Excellence Framework. This two-year project is currently at its mid-point, and the team has organised two key initiatives to mark the moment. The first is Academic Book Week, taking place this week between 9 and 16 November 2015, which sees partners from around the UK put on special events and activities exploring the project’s central focus. The second initiative is the publication of the book under review here. 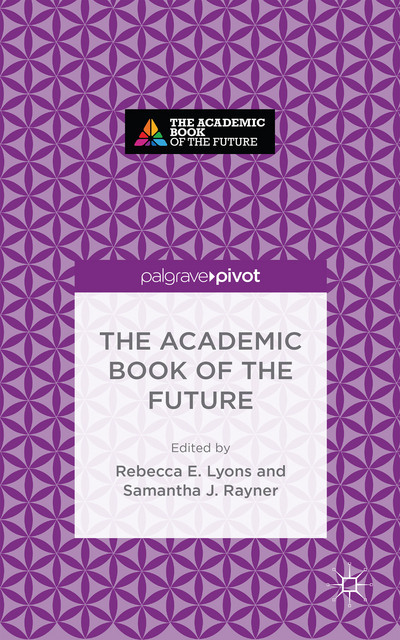 This short collection of essays on the future(s) of the academic book has been published as part of the Palgrave Pivot series, a new initiative for Palgrave Macmillan. In the book’s fourth chapter, authored by Palgrave’s own Jenny McCall and Amy Bourke-Waite, we discover that these books typically consist of 30-50,000 words and are published with a rapid turnaround time – just twelve weeks from the point of acceptance. They are primarily available digitally, but a printed copy can be obtained via print on-demand. These speedy projects neither require camera-ready copy nor compromise on editing processes. They merely obligate the author(s) or editor(s) to be prepared to submit swift answers to enquiries. As an example of this kind of publication, The Academic Book of the Future provides an excellent model. The collection brings together a thoroughly impressive set of contributors: academics, publishers, booksellers and librarians. Each showcases their importance as a stakeholder in the debate on the future of academic books with laudable energy, and this is reflected by the impassioned introduction offered by Rayner and her Research Associate on the project, Rebecca E. Lyons. Rayner and Lyons set out the rationale for the publication with considerable enthusiasm, compellingly and articulately highlighting the importance and timeliness of the conversation(s) that this book hopes to provoke. A clear summary of each of the chapters is also provided, helping the reader to grasp the various approaches that the book attempts to cover. The chapters themselves range from interesting and insightful to quirky and provocative. Taken individually, they are lucid and thoughtful musings on the central topic. Bringing them together usefully allows a range of voices and opinions to be aired in conversation with each other. It does, however, also bring a few issues: inevitably, there is a certain unevenness to the contributions – the styles, for example, do not always cohere well. Some chapters are thoroughly academic, some are more journalistic, whilst others are quite informal (with frequent drops in register). This is not a significant problem for a publication of this kind, but one might feel that, if there had been a longer period allowed for copy-editing, the editors might have been able to address this. That said, given that the reviewer’s copy is an uncorrected proof, there is a remarkable lack of infelicities (for which the editors are to be applauded), and it is not impossible that some of the inconsistencies in style will have been ironed out prior to final publication. Additionally, some chapters do reiterate arguments already made elsewhere in the volume – overlap is to be expected, of course, but some cross-referencing between chapters might have allowed a greater sense of cohesion. Finally, several of the chapters end on rather generic conclusions – simply suggesting, for example, that the stakeholder in question will have an important role to play in the future of the academic book, which is rather self-evident. I do acknowledge, however, that when writing about the future, it is hard to know how else one might conclude without inadvertently claiming a talent for clairvoyance! Amongst the chapters themselves, some stand out as truly excellent contributions. The opening chapter, a balanced discussion of the academic book and the various associated conflicts of digital and print by Tom Mole (Director of the Centre for the History of the Book, University of Edinburgh), provides an appropriate introduction to the volume, picking up (consciously or otherwise) on the various threads that will be returned to throughout the book. Similarly, the chapter by Sarah Barrow (Head of School of Film and Media, University of Lincoln) on alternative formats for research outputs (such as the video essay) is genuinely transformative in setting out a rationale for taking such initiatives forward. From her perspective as Associate Director of Collections and Research Support at UCL, Kate Price’s consideration of the academic book beyond the academy also remains in the memory for its well-argued enquiry into the volatility of digital content, and the ways in which libraries can assist with this issue. Meanwhile, the chapters by Peter Lake (Group Business Director, JS Group) and Craig Dadds (University Bookshop Manager, Canterbury Christ Church University), on undergraduate textbooks and the role of university bookshops respectively, also dovetail neatly and round off the analysis well. It is clear that a great deal of energy has been put into producing this volume, and it is undoubtedly a useful and well-timed book. Even its physical form, being both brief and available through Open Access, gives hints as to just some of the innovations developing in the world of academic book publishing. The editors have evidently worked hard to ensure that a rounded, clear and succinct view of the debate is offered, taking into account a variety of stakeholders. One might question whether the opinions of ‘users’ might have been foregrounded a little more explicitly, but the chapters by academics at least allow for an implicit insight into that side of the argument. Overall, this book serves as a strong and important reflection of the project’s aims and objectives at its current stage. It also offers a tantalising promise of what the project will ultimately contribute: an informed and valuable consideration of how the academic book must develop if it is to fulfil the needs of those who engage with it. Dr Leah Tether is Senior Lecturer in Digital Humanities at the University of Bristol, having formerly been the Course Director for the MA in Publishing at Anglia Ruskin University. She is also the Research Officer for the Association for Publishing Education.